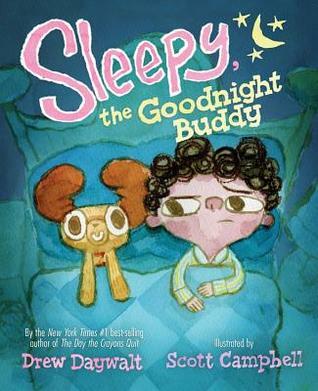 Today I'm over at the ALSC Blog talking about some of my new favorite bedtime-themed books! 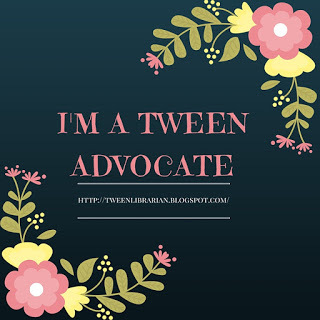 There's nothing like girl power mixed with graphic novels to kickstart a return to blogging! 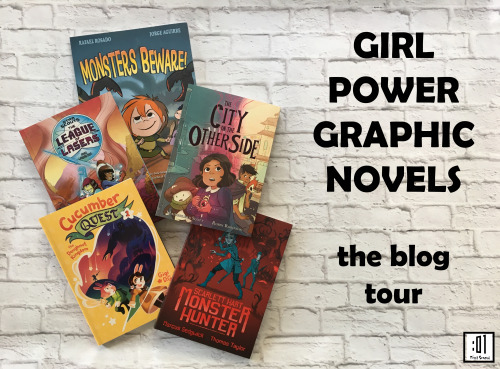 First Second has long been one of my favorite graphic novel publishers, so when they asked if I wanted to be part of a special tour highlighting girl power graphic novels, I couldn't say no. They have some great new releases and some older favorites that you must add to your collection if you have graphic novel fans at your library-or at home. 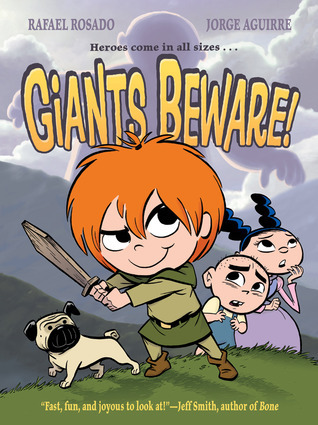 I first read Giants Beware! when it came out a few years ago and I loved it! About the Book: Claudette dreams of being a giant slayer. But her village has no threats from giants since a giant slayer years ago. Claudette doesn't believe the stories though and she believes it's her duty to find and slay the giant that lives beyond her city. Along with her best friend Marie (an aspiring princess) and her brother Gaston (a pastry chef in the making), Claudette sets out on a fantastical journey to slay the giant and become a hero-so giants beware!! GreenBeanTeenQueen Says: If your library tweens are anything like mine, they are always asking for the graphic novel series Bone. 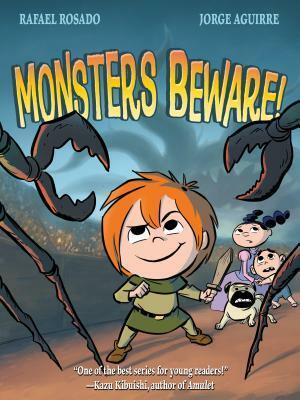 Giants Beware is the perfect graphic novel to hand over to those readers who like humor mixed into their adventure fantasy. It reminded me of Bone crossed with The Princess Bride with a touch of the adventure from Amulet. The full color illustrations make this graphic novel fun to read. There is a lot of detail in the artwork, which I always enjoy and I felt as though I really got to know the characters. Claudette is strong and very spunky-she will get her way no matter what! She's a bit selfish and thinks of herself first, but she learns the importance of her friendship with Marie and Gaston along the way. And how could you not love Gaston and Marie? They both have dreams that might seem silly to anyone else, but they fully believe they can make them come true and you can't help but cheer them on. The three together make a delightful group that you would want to tag along with you on any adventure. The supporting characters all felt fleshed out-from the townsfolk to Claudette and Gaston's father-each character was fully realized, even if they only appeared briefly. In many ways this graphic novel read like an animated film-the illustrations, the jokes, the characters-all could transition easily to the big screen which could make a nice selling point to readers. 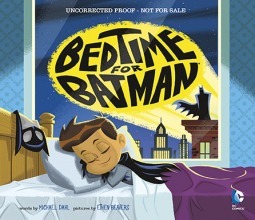 Add this one to your graphic novel collection and I'm sure it will fly off your library shelf. While the story wraps up, there are some loose ends that leave a possibility of a sequel (or several) featuring Claudette, Marie and Gaston and I'm really hoping this isn't the last we've seen of them! In my review, I had mentioned how much I had hoped there would be more to this series and I'm thrilled to say there are more! Dragons Beware! and Monsters Beware! 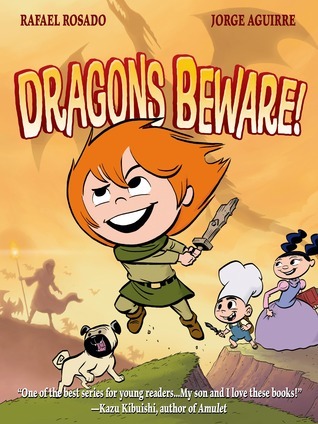 are hilarious adventures featuring these memorable and lovable characters. If your library is anything like mine and you can't keep graphic novels for middle grade on the shelf, you have to tell kids about these books-and I think you can even sell adults on them with the Bone mixed with The Princess Bride feel. My four-year-old was so interested in the covers he wanted to read them all. We made it through a few panels, mostly to look at all the bad guys, and he loved the art. I'm looking forward to when he's older and I share these awesome stories of standing up for yourself, being who you are, and girl power. 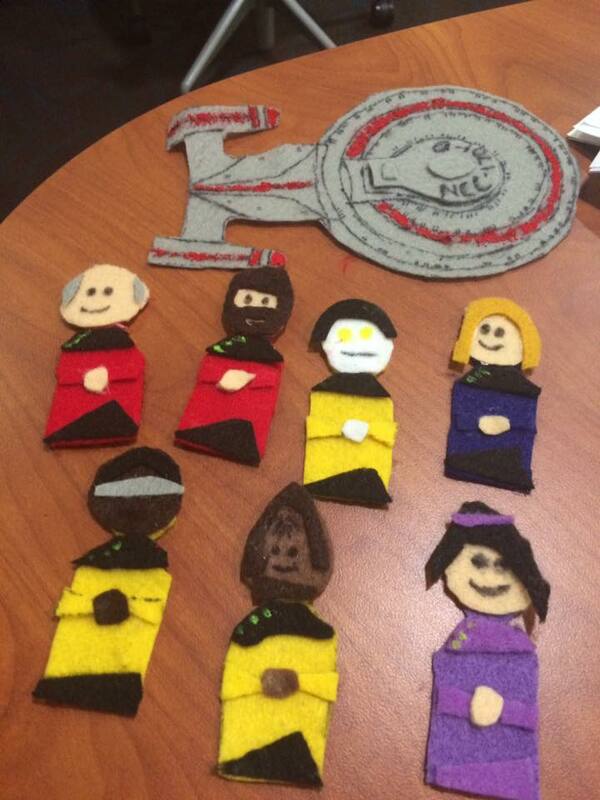 With LibraryCon 3 only two months away, it's about time I wrote about last year's event! Sheesh! But I'm back with lots of LibraryCon notes! You can read about planning LibraryCon Year 2 here. 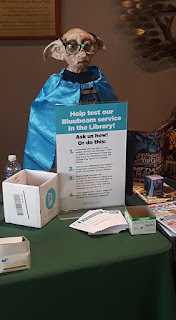 I thought I would devote an entire post to Geeky Storytime at LibraryCon since it's one of the things I get asked most about. For year 2, we decided to utilize our StoryHour Room as a tabletop gaming room, which meant we needed a new spot for Geeky Storytime to kick off LibraryCon. We opted to host it just outside the children's department, as we have an open area there, we could fit more people, and we hoped we could draw more attendees this way. All of that worked out perfectly and just as we had hoped! I started off the storytime with welcoming everyone to LibraryCon and Geeky Storytime by playing Hedwig's Theme. This worked great as drew people to the area and let them know something was going on. I had a hard time deciding what books I wanted to read as I wanted fandom based stuff, but also general fantasy/science fiction stuff too. 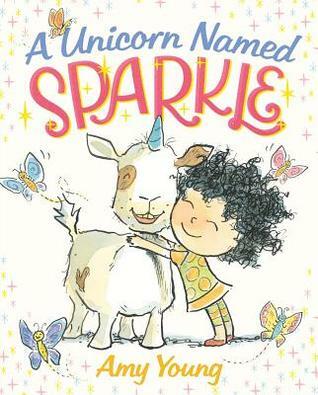 I opted to go with a newer title, A Unicorn Named Sparkle by Amy Young as I wanted something new that my audience had most likely not read yet. Then it was time for a song. I tried to get the kids up and moving with We Are Monsters by The Learning Groove, but most of my crowd wasn't interested in getting up and dancing. So I might cut out more action oriented songs next time as they were feeling a bit shy. Rhyme time again! I used Did You Ever See a Superhero from Storytime Katie. Since 2016 was the 50th anniversary of Star Trek, we decided to hold special TrekTalks throughout the day. I wanted to included something Trek related in Geeky Storytime too, so I created a flannel for Star Trek: The Next Generation and made up a Five Little Crewmen Jumping on the Bridge Rhyme in which Picard of course calls Doctor Crusher for help. Sadly, I don't think I had any kids that even knew the characters, but the adults had a good laugh. The kids thought Worf was Chewbacca and Troi was a princess. But hey-this is why I do Geeky Storytime! We need to fully educate our future geeks! Since I had mostly Star Wars fans, and the local Garrison cosplayers were at LibraryCon, I had to do a Star Wars song too. I took the tune of BINGO and changed it to "V-A-D-E-R"
I used the white board pictured above to spell out Vader and on the other side was a picture of Darth Vader to signify when to clap that letter. The kids of course loved this one. I added his words and some pictures of each Pokemon to some cardstock and created big flashcards to sing along with. This was another very popular one, especially since we had some cosplayers for Pokemon and many kids catching Pokemon in the library. To finish our very special Geeky Storytime, I brought out of huge parachute and tossed the TARDIS around to the Doctor Who theme. Today is The Very Hungry Caterpillar Day! I can't say enough good things about the beloved book by Eric Carle. I loved it as a child, I loved it again as a librarian, and I love it even more as a parent. The Very Hungry Caterpillar is such a great storytime book. There are so many ways to use it! 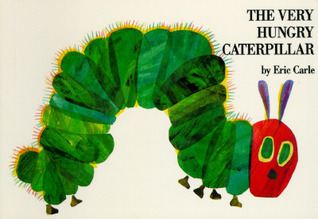 Of course, I love reading it and even adding music and singing as the caterpillar munches his way across the pages. But my most favorite way of telling this story is through our Very Hungry Caterpillar sock puppet. I'm not sure where the sock puppet idea came from originally at my library as it was made before I started there, but you can see an example of one at Busy Crafting Mama who shared one for Flannel Friday a few years ago. The idea of the storytelling puppet is that you wear the caterpillar sock on your arm and add the various foods as you tell the story and move the food up your arm and then end with a beautiful butterfly! It doesn't matter what age group I use the caterpillar puppet with-it always has the same effect. The kids, and often the parents, are just in awe of the magic of storytelling and there's an excitement in the room after the caterpillar transforms into a butterfly. It's one of my most favorite moments as a librarian and it happens every time I tell this story or read this book-it never gets old. I also learned to love The Very Hungry Caterpillar even more as a parent. It was one of the first books BabyGreenBean learned to "read" and his stuffed toy caterpillar was a constant companion during his first year. He had the stuffed caterpillar before he read the book and one day, when he was about one, I brought the book home from the library to read to him. I pulled it out of my bag and his eyes lit up with recognition-it was caterpillar! It was such a great moment as a librarian mama! Now he knows the story well enough he "reads" the book and re-tells the story himself with his Very Hungry Caterpillar lacing cards. He loves Eric Carle's books and loves finding caterpillar hidden in The World of Eric Carle logo as well as sorting all his Eric Carle books together because he recognizes the illustrations. Seeing him love the book makes me fall in love with it even more. 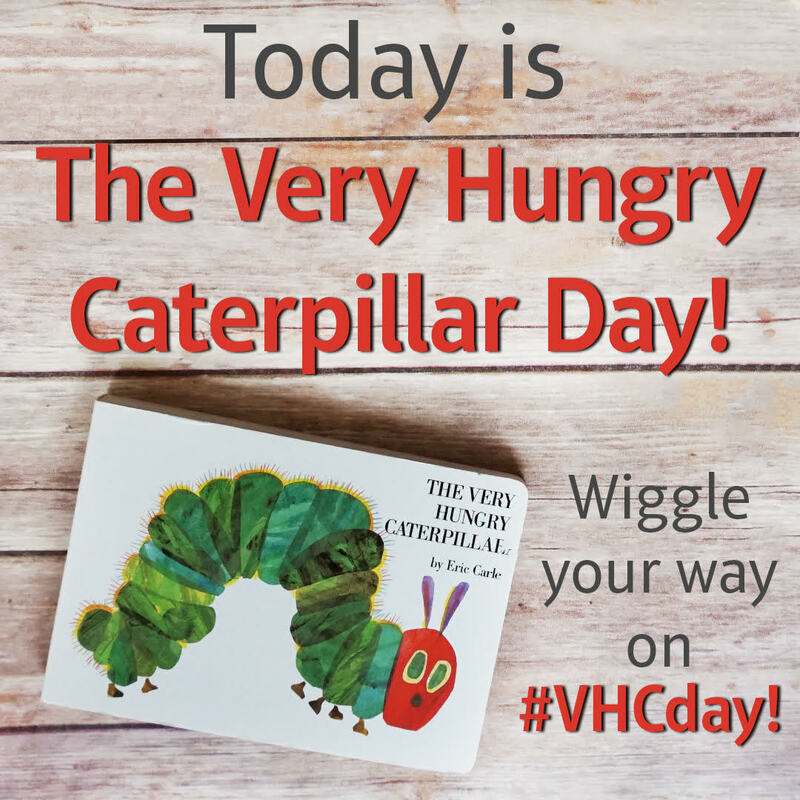 In honor of The Very Hungry Caterpillar Day, Penguin Young Readers has a giveaway! Enter for a chance to win one (1) of five (5) copies of The Very Hungry Caterpillar by Eric Carle (ARV: $21.99 each). NO PURCHASE NECESSARY. Enter between 12:00 AM Eastern Time on March 20, 2017 and 12:00 AM on March 27, 2017. Open to residents of the fifty United States and the District of Columbia who are 13 and older. Winners will be selected at random on or about March 29, 2017. Odds of winning depend on number of eligible entries received. Void where prohibited or restricted by law. Well, I finally have time to sit down and type up all my thoughts about LibraryCon Year 2, or as I lovingly called it, Revenge of the Con!!! Yet even with that success (400+ in attendance, great feedback from attendees and participants), we realized after the fact that we forgot all about marketing and promoting the Library itself. We figured people would walk into the Library, but with nothing to draw them there and with the entire event being held in our main concourse and meeting rooms, no one actually entered the Library. So the first item up on our planning agenda was to figure out how to promote ourselves. We also helped our gift shop set up a sidewalk sale of geeky items like buttons, mugs, bags, stickers, etc. Our gift shop is right next to our front entrance so it got tons of traffic and was another way to promote the Library-and give money back to the Library since the shop is run by our Friends group. Since attendees failed to enter the Library last year and we didn't want to crowd everyone into the concourse, we decided to bring some of the guests and vendors out into the Library. We created an "author's alley" just outside of the teen area which brought people into the Library. It also helped promote our science fiction, fantasy, horror and comic areas both in teen and adult since the tables were set up near the stacks. We also used the story hour room as an all day tabletop gaming room, which was a huge hit and busy all day long! And we moved things like the illustrator draw-along and Geeky Storytime into an area outside of the children's department so it was more centrally located in the Library. In year one, we weren't sure what the response would be like and planned long breaks between each panel-and we only had three panels. We heard from attendees they wanted more and we realized we didn't need to worry about breaks, attendees would plan their own. So we added more panels and more consecutive things happening to hopefully help with crowd control. Giving attendees more options of things to do at one time helped with people not getting bored or restless with the con. I am always trying to promote librarians as experts and try to promote that we excel at reader's advisory. Since this is a group of people who were likely readers and who were interested in genre fiction, I recruited a group of co-workers and some of my staff members to kickoff our panels with a panel presented by librarians. We titled our session "What Geeks Should Read Next: What's New in Fantasy, Science Fiction, Horror and Comics"
The staff that participated are all pretty geeky readers themselves, so it was lots of fun putting together a list and really hard to limit ourselves to just four-five titles to talk about! We also had a great mix of age range among the panelists as well as what we read, so we were able to cover multiple genres and age ranges from middle grade, young adult, and adult. I asked all the panelists to focus on titles that had either been released in the last six months of were upcoming in the Fall 2016 or Winter 2017. We also gave away lots of book swag at this panel. It was a great way to promote the Library and our staff as experts in what to read next. We heard from many attendees that this was their favorite panel of the con-yes! As far as promoting the event, we had fliers with a full agenda and a Facebook event page made in addition to our regular promotion in our programming guide, newspaper listings, and Library website and Facebook. The Facebook page was the best promotion we got as our guests and vendors could share it with friends and fans and post teasers about what they were bringing-several artists did this! It was also a great way for us to answer questions people had about the event (Was it free? Yes. Open to all ages? Yes. Registration? No. Family friendly cosplay welcome? Yes.) We also posted about giveaways and other tidbits to get people excited leading up to the event. More to come on how all our planning took shape and what year 2 turned out like! 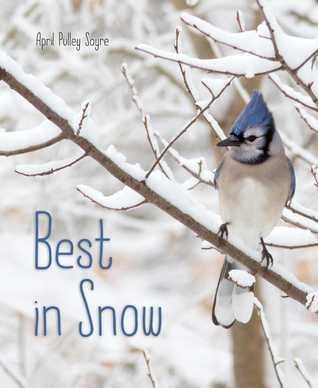 Today I'm over at the ALSC blog talking about my new favorite winter themed storytime books. Please join me! About the Book: Nolie is spending the summer in Scotland in a small village with her scientist dad. He's there researching the Boundary-the mysterious fog at the edge of Journey's End. The fog seems to be moving closer but the town can't take any warnings of danger too seriously-the fog is their livelihood and tourism depends on it. Especially for Bel's family who runs a tour boat out to the Boundary. When Nolie and Bel strike up a friendship the two become entangled in the mystery of Journey's End the fog that may be making it's way to devour the town. When Albert appears, a boy who went into the fog in 1918 to light the legendary lighthouse, Bel and Nolie know something strange is happening in Journey's End it's up to them to save the town and stop the fog from claiming more lives. 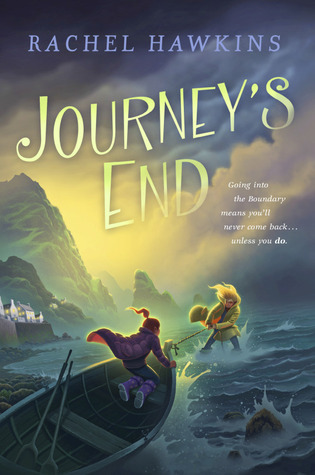 GreenBeanTeenQueen Says: Journey's End is a bit mystery, a bit of a friendship story, a bit of a spooky ghost story, and a lot of fun. I'm so excited to see Rachel Hawkins writing middle grade and she gets the voice and tween turmoil just right. In the midst of a mysterious fog creeping into town, this novel is about friendship and forgiveness. Bel is working through her hurt from her best friend growing up and ditching her for a new girl. Nolie is dealing with her parent's divorce and how that has changed her. The girls friendship with each other helps them find understanding and forgiveness. Add in some mysterious fog and a missing boy coming back 100 years later and you've got a very readable and likable mystery for middle grade readers. The mystery element is part paranormal, part legend, part ghost story and I think readers who enjoy ghostly happenings that aren't too spooky will enjoy this novel. Things never get too scary and there's also a good dose of humor from Nolie who likes to joke around and from Albert, adjusting to life in the twenty-first century. I listened to this book on audio and I loved the narrator's accents for each character. A bit southern for Nolie's Georgia accent, Bel's Scottish accent, and Albert's thicker brogue. I also liked that the audiobook added to some of the humor and upped the tension in certain scenes. I would suggest this in book and audiobook format to my interested readers. As part of the tour, I thought I would give my top reasons to check out Journey's End. 1. It's the perfect read for a cold, foggy, wintery morning. Nothing better than reading about some creepy fog while you can look outside and see eerie fog yourself! 2. It's a ghostly story that's tame enough for readers looking for something gentle. I promise you won't be scared! But you may think twice about the weather! 3. It's ToddlerGreenBean approved! I had my print copy of this one sitting on the couch and every time it was out, ToddlerGreenBean would pick up and want to read it to me. Something about the cover fascinated him and I think he'll be enjoying this one in a few years! Be sure to keep Journey's End in mind if you have readers looking for light mysteries. It's a nice mix of stories I think it will find many fans.